So, it's no secret between my tattoo artist and I that I hate getting tattooed. I love having tattoos, but I hate the process of acquiring them. That being said, I get through this challenge by using essential oils. There are no specific oils that are set aside for this one activity (like the oils for anxiety or stress). This is very individual. I've tried other forms of distraction, like reading, listening to music, watching videos on my phone, but when the artist hits that sweet spot, distraction no longer works for me. Sometimes the essential oils don't work as well as I want them to either, but it's what I have found that works best for me. I use different blends each time. Most of the time what I do is, the morning I'm going in for a tattoo session, I pull out my oils and start smelling them. Whatever gives me that instant relaxed feeling gets dropped 1 mil Bottle, and I mix my blend. There really is no rhyme or reason to it, but it works. 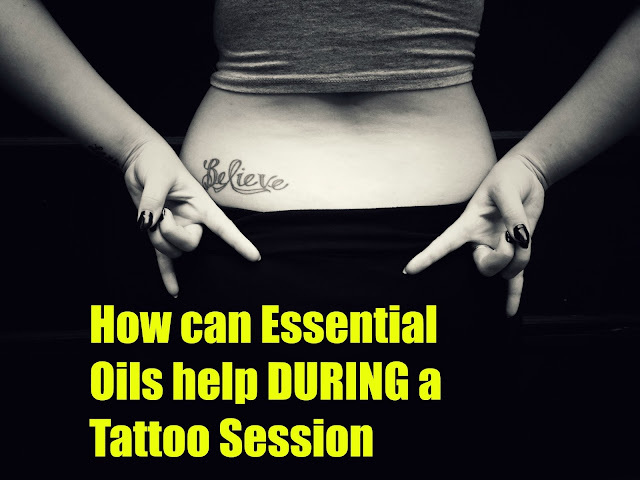 With the help of essential oils, I can sit in a session longer. It distracts me from the pain of being tattooed. It’s that simple. The essential oils seem to relax me to the pain and it doesn't seem as bad. It may be a placebo for me, but I'll take it. This depends on what I'm getting tattooed. Right now, I'm working on my back so I've done a few things. I bring an Essential Oil Inhaler and drop the blend on a piece of cloth that I can have near my nose. Tattoo shops can often times be cold, so I drop essential oils on my zip up sweatshirt sleeve and wear it backwards. You can also dilute the essential oils and wear them.